We conservatively value Citi at just over $65/share (vs. the current price of $51) equivalent to ~$200bn on ~3bn shares outstanding. Adjusted for the effects of the deferred tax asset (DTA), the core Citicorp business generates a return-on-tangible-equity of 14% (see Table below) conservatively consistent with a valuation of $175bn or 1.4x allocated tangible common equity of $125bn. 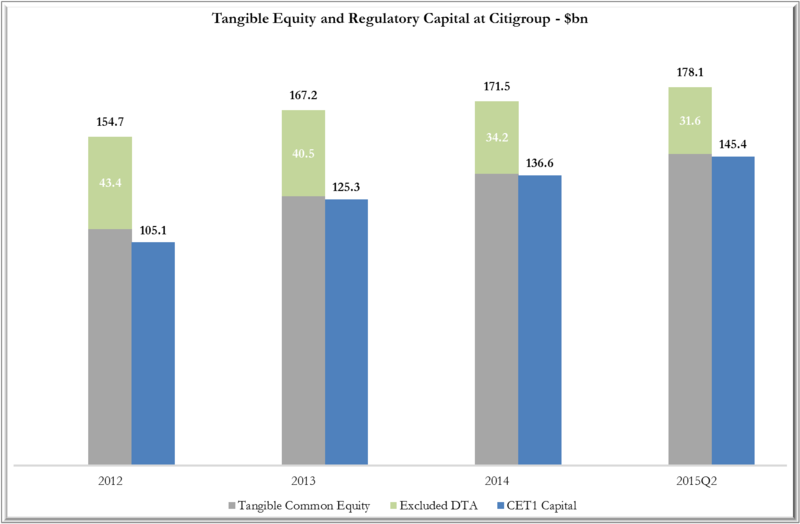 Based on run-off over an 6 years, and assuming management can meet its commitment to maintain CitiHoldings at breakeven even after the sale of One Main, we value the remaining $50bn of Citigroup TCE (supporting the DTA and CitiHoldings) at $30bn. We see this valuation as conservative in part because it does not take account of the excess capital C presently enjoys with a fully-implemented B3 CET1 ratio of 11.4% versus the minimum requirement of 10.5% (including a 3.5% G-SIB surcharge); even allowing for a 50bps buffer to accommodate negative marks on the available-for-sale securities portfolio as rates back-up, this represents excess capital of $6-7bn on risk-weighted assets of ~$1.3tn. 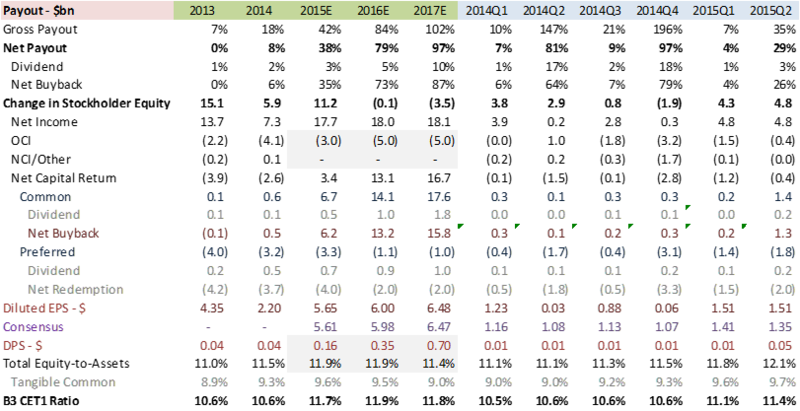 While management has noted that, in practice, the CCAR tests will be more of a binding constraint, the mid-cycle stress results reported on July 22nd suggest C has substantial headroom there as well (see Table 2). While the CCAR process is uncertain by design, we expect C to be able to increase its payout ratio meaningfully to ~80% in 2016 from ~40% in 2015 corresponding to a net buyback of ~$13bn and after allowing for $5bn of capital to support negative securities marks (flowing through other comprehensive income or OCI). This will allow a 6-7% reduction in stock count even assuming the stock price increases from the current $51 to our valuation of $65 as shown in the summary payout analysis below. Our full model is included in the Appendix. This note, “C – Expect Improving Returns and Rising Payout to Lift Stock Multiple” is a companion-piece to our deep-dive note of August 3rd looking at the return to organic growth in C’s North America consumer business which accounts for ~one-quarter of core (i.e. 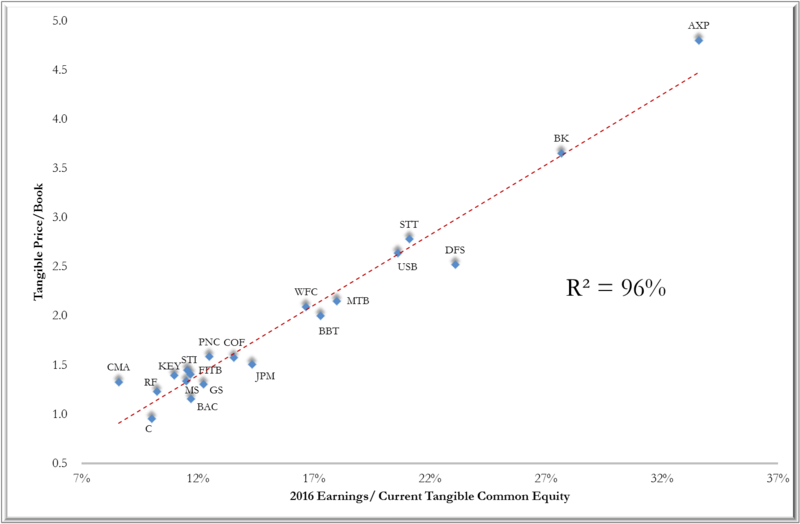 Citicorp) revenue and earnings before corporate items (see Exhibit 1). As shown in the preferences below (see Exhibit 2), C is one of our favored names. After falling 20% from its recent peak valuation towards the end of July, as concerns about US interest rates and about the growth and balance-of-payments resilience of emerging markets, have affected the market in general and bank stocks in particular, Citigroup (C) is now trading at ~15% discount to tangible book value of just over $59/share (see Exhibit 3). We believe emerging-market risk is over-discounted given 60% of emerging market loans of $235bn through the institutional clients business are in treasury and trade solutions and the private bank; of the remaining 40% which is traditional corporate lending most of the exposure (e.g. nearly 70% in China) is to the local subsidiaries of large multinationals. 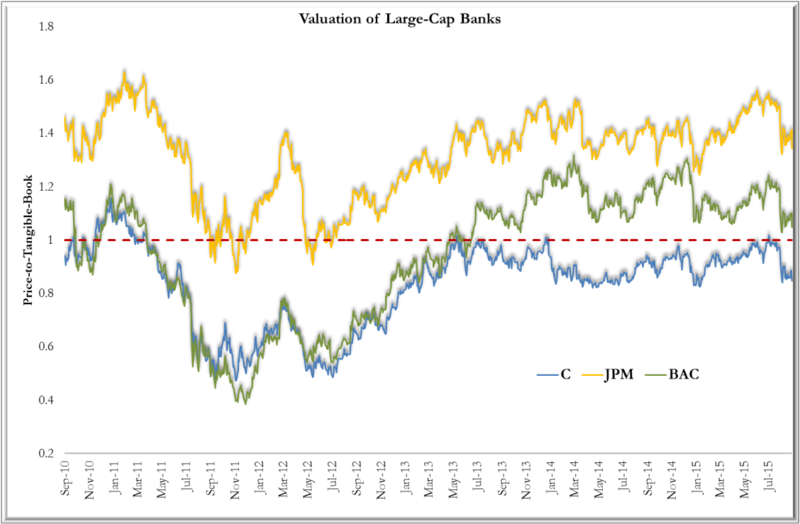 As is well known, valuation differences between banks are largely driven by expected profitability. For an (admittedly small) sample of banks, expectations for 2016 return-on-tangible-equity (ROTCE) account for all but 4% of the variation in price-to-tangible-book ratio (see Exhibit 4). This result is all the more extraordinary given meaningful differences in the balance-sheet strength and long-run (i.e. beyond 2016) growth prospects, and represents an opportunity for investors willing to lean on a next-level analysis. For C, this next-level analysis involves treating the core portion of the bank (CitiCorp) separately from the non-core portion (CitiHoldings) and adjusting valuation to take account of the very large deferred tax asset (DTA). Specifically, if CitiCorp were standalone and not saddled with a DTA, it would have generated an ROTCE in 2015H1 of 14% (see Exhibit 5) conservatively consistent, under the above regression, with a valuation of 1.4x tangible book of $125bn or $175bn. DTA (supported by $33bn of TCE): In practice, the benefit of running-off the DTA is that it converts the supporting TCE, which is excluded from regulatory capital calculations, to CET1 capital at a rate that is currently ~$5bn/year (see Exhibit 6). Assuming this continues for a further 6 years, until the DTA of just over $30bn is exhausted, the present value at a 10% discount rate is ~$20bn. CitiHoldings (supported by $17bn of TCE): Since 2011, Citi holdings assets have fallen by $144bn to the current level of $116bn and now represent just 6% of the firm-wide balance sheet (albeit ~13% of risk-weighted assets at $169bn with the excess over GAAP assets due to operating risk). Management has indicated there are $32bn of asset-sales in the pipeline and committed to winding down the business in an “economically rational” manner while “staying above breakeven”. Indeed, even with the planned $4.25bn sale to SpringLeaf of One Main (included in the above $32bn but now likely delayed into 2016 because of potential anti-trust concerns) which is a significant contributor to profits, CFO John Gerspach expects to maintain CitiHoldings at “no worse than breakeven on an annual basis”. Within CitiHoldings, ~90% of assets are consumer-related and with the consumer loan portfolio being ~$54bn (see Exhibit 7). The run-off rates vary with North America residential first mortgages declining 30% over the last year while home equity balances are down less at 15% largely because there is a limited market for the latter given uncertainty over the credit-impact of rate-resets. 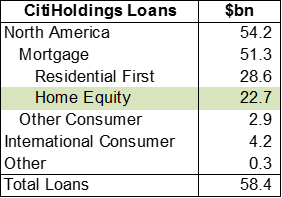 At the current run-off rate of ~$1bn/quarter, the home equity book has a duration of ~6 years suggesting a similar haircut to the TCE associated with the DTA and, if applied across all of CitiHoldings, a valuation of ~$10bn. This is likely conservative given that residential first mortgages are running-off more quickly than home-equity and that the marketability of home-equity loans will likely improve as the portfolio demonstrates credit-resilience through the reset period of the next couple of years.